just wait till your dad gets home! Since God is the God of second chances, I thought I’d follow his example and give Mr. Darcy a second chance. So I moved or removed the temptation toward mischief, feeling certain she couldn’t reach what I pushed way back toward the wall. And for insurance, I made sure she had her favorite pumpkin toy in there with her. Returning home for my lunch hour, you no doubt guessed what I found. Mauri comes home tomorrow—and I’m tellin’! 6 Responses to just wait till your dad gets home! I am sorry, but I really laughed out loud at this picture. She just looks so innocent and sweet! Although I don’t think I laughed out loud when our dog has done similar naughty things. So many dead rolls of TP… and the pumpkin toy looks unscathed! I guess we know what her favorite toy is now! 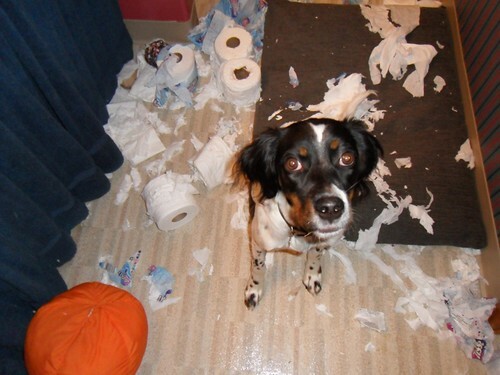 Isn’t a roll of toilet paper a small price to pay for contentment?? ?Better toilet paper than the door jam….. I can relate – it IS a good opportunity to excercise laughter rather than anger – I KNOW you were laughing – that’s why you grabbed the camera!!! So we had a paper-loving dog as well. Since Mr. Darcy has already messed up at least 5 large rolls of Costco TP, I’d say the dear dog really hasn’t finished her job and you best fill up your car with gas for the upcoming trip to Costco!